Jerusalem is well accustomed to visitors and ready for you. Now it’s time for you to get ready for Jerusalem! Are you looking for some basics for getting around? We’ve put together some quick tips on things that include language, weather, religious site decorum, the Sabbath, traffic, safety and security, and communications. We’ve also added in our suggestions regarding what to pack (but rest assured, you’ll be able to buy what you need at the airport or in any central part of Jerusalem). Israel has three official languages: Hebrew, Arabic, and English. 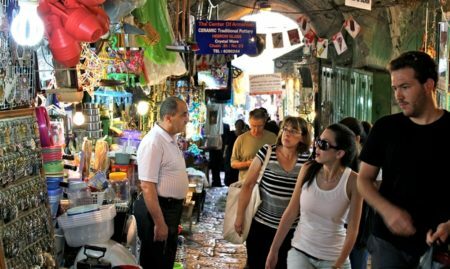 The streets of Jerusalem are filled with English speaking immigrants and tourists, and you’ll have no problem getting by. Tour venues and most shops and eateries have staff that are fluent in English. Furthermore, street signs are all translated into English. In addition, you’ll hear a lot of Russian, French and Spanish. What to Pack: A dictionary, but only if you want to work on your Hebrew or Arabic. If you prefer to speak in English, you’ll be just fine in Jerusalem. Israel effectively has two seasons: Summer (no rain) and winter (the rainy season). Summer is from May to September, and is characterized by being arid and hot, with heat peaking in July/August. The winter season is generally from November to March, with cool, wet conditions and temperatures occasionally reaching freezing. Snow is rare. The weather in the intermediate seasons of spring (April) as well as fall (October) can go either way. Read more about weather. What to Pack: A good winter coat and solid rain protection for September-April, and a light jacket or for times when you’re not sure about the weather. During summer, the nights can be cool so pack a long-sleeve and in winter, pack layers for warmer days. The service sector in Jerusalem is open Sunday through Friday, with Friday closing earlier for the Sabbath. Shops/Restaurants/Attractions: Opening around 9-10am until close 7-9pm, depending. Banks: Usually 8:30am-1:00pm as well as reopening some days of the week from around 4-6pm. ATM machines operate 24/7. Seeing as Jerusalem is a major center of tourism, there is an amazing range of tours available for you to choose from. Check out Jerusalem day tours, awesome Dead Sea and Masada Tours, Nazereth Tours and more. 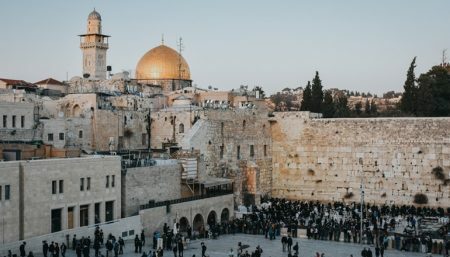 Religious areas in Jerusalem include the Old City, any synagogue, church, or mosque, and some ultra-orthodox neighborhoods such as Meah Shearim. In these areas, it’s appropriate for women to have arms covered, and to don dresses or skirts (a skirt can be wraparound, and worn over pants). Men should wear long sleeves and pants. Also, couples generally refrain from touching in these places. What to Pack: Men – Pants/Long Sleeve Shirts; Women: Skirt (can be wrap around) and long-sleeve shirt or cover. The Jewish Sabbath (“Shabbat”) and Jewish holidays begin before sundown, and end 25 hours later, about an hour after sundown. By and large in the Jewish areas, the city closes down and gatherings move mostly to synagogues and homes. This having been said, major industries maintain operation (including hotels) with some changes to practice in order to observe the laws of Shabbat. For example, since manual electricity usage is prohibited by Jewish law on Shabbat, timers are put in place on elevators, heaters, and ovens. However there are several museums, movie theaters, restaurants, and bars that remain open. Emergency services remain fully functional. If you need grocery items or drug stores, you can try the non-Jewish areas in the Old City or eastern Jerusalem. Likewise, there is no public transportation on Shabbat, but taxi cabs do operate. So, no point waiting at a bus stop unless you’re waiting there for a taxi! You can also order a taxi by phone. Most roads remain open, save for some ultra-Orthodox neighborhoods so if you’re driving on Shabbat, you’ll need to take that into account. What to Pack if Attending Shabbat Worship or Meals: Casual Dressy Clothing. Men – Pants/Long Sleeve Shirts; Women: Skirt or Dress and long-sleeve blouse or cover. In Israel, sit-down waiter services are tipped 10-15% on the total bill. At service counters, you might see a tips glass, but tipping is not required. For cab services, tipping is not required, yet one might choose to round up rather than accept small change. It’s easy to stay in touch when visiting Jerusalem. If bringing your mobile phone, check into renting a SIM card locally, as it might be cheaper than arranging usage via your home mobile phone company. Wireless internet abounds in many restaurants and outside hubs, as well as most hotels, and internet cafes are prevalent in popular areas. For more information, you can reference our page on Internet and phones in Jerusalem. What to Pack: Your mobile phone and laptop, with chargers, if desired. Sockets are round-pronged and the three-pin variation, although two-prongs also work, so depending on your electrical device, you might need a plug adapter. Israel operates on 220V AC, like in Europe, therefore 110V appliances (usually from the US) will need a transformer. What to Pack: Transformer 110-220 (if US-based), and plug adapters. These can easily be purchased in the airport or in most electronics store as well. Stay alert, as Israelis are known for fast driving. At the same time, traffic laws are effectively the same as in any western country, except for crosswalks where cars only need to stop if a pedestrian has already begun crossing. For personal safety, one should take precautions as any tourist might, even though Jerusalem maintains a low crime rate. You’ll likely feel as secure as you would in any western country – Jerusalem visitors say it’s not at all like what you might see in the mainstream media. At the same time, it is normal to have private security guards at entrances to most venues and stores, and police or army patrolling central areas. Read more about safety and security and emergency services. What to Pack: Passport pouch for inside the shirt, and wallet which fits in front pocket. Planning your trip and looking for an overview of Jerusalem? Check out our Jerusalem overview.